The forward search provides a method of revealing the structure of data through a mixture of model fitting and informative plots. The continuous multivariate data that are the subject of this book are often analyzed as if they come from one or more normal distributions. Such analyses, including the need for transformation, may be distorted by the presence of unidentified subsets and outliers, both individual and clustered. These important features are disguised by the standard procedures of multivariate analysis. The book introduces methods that reveal the effect of each observation on fitted models and inferences. The powerful methods of data analysis will be of importance to scientists and statisticians. Although the emphasis is on the analysis of data, theoretical developments make the book suitable for a graduate statistical course on multivariate analysis. Topics covered include principal components analysis, discriminant analysis, cluster analysis and the analysis of spatial data. S-Plus programs for the forward search are available on a web site. This book is a companion to Atkinson and Riani's Robust Diagnostic Regression Analysis of which the reviewer for The Journal of the Royal Statistical Society wrote "I read this book, compulsive reading such as it was, in three sittings." Anthony Atkinson is Emeritus Professor of Statistics at the London School of Economics. He is also the author of Plots, Transformations, and Regression and coauthor of Optimum Experimental Designs. Professor Atkinson has served as Editor of The Journal of the Royal Statistical Society, Series B. This book is concerned with data in which the observations are independent and in which the response is multivariate. Companion book to Robust Diagnostic Regression Analysis (ISBN 0-387-95017) published by Springer in 2000. 3.5 What Have We Seen? 5.2.1 Linear Transformations and Principal Components . "The book requires knowledge of multivariate statistical methods, because it provides only basic background information on the methods considered (although with excellent references for futher reading at the end of each chapter). Each chapter also includes exercises with solutions...This book could serve as an excellent text for an advanced course on modern multivariate statistics, as it is intended." "This book is full of interest for anyone undertaking multivariate analyses, clearly emphasizing that uncritical use of standard methods can be misleading." "This book is an interesting complement to various textbooks on multivariate statistics." "This book discusses multivariate data from a different perspective. ... it is an excellent book for researchers with interests in multivariate data and cluster analysis. It may also be a good reference for students of advanced statistics and practitioners working with large volumes of data ... ."
"This is a companion to an earlier book ... both of which feature many informative graphs. Here, the forward search has been applied in detail to classical multivariate approaches used with Gaussian data. ... One valuable feature of the book is the way that the illustrations concentrate on a relatively small number ... . This makes it easy to concentrate on the application ... . The implications of this book also strengthen the importance of data visualization, as well as providing a valuable approach to visualization." "This book is a companion to Atkinson ... . The objective is to identify outliers, appreciate their influence ... which would result in an overall improvement. ... Graphical tools are widely used, resulting in three hundred and ninety figures. Each chapter is followed by extensive exercises and their solutions, and the book could be used as an advanced textbook for multivariate analysis courses. Web-sites provide the relevant software ... . 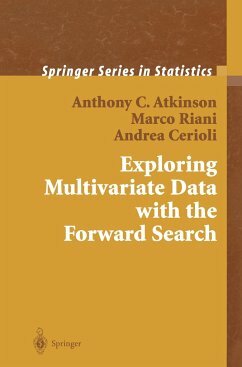 This book is full of interest for anyone undertaking multivariate analyses ... ."
"This book discusses forward search (FS), a method using graphs to explore and model continuous multivariate data ... . Its viewpoint is toward applications, and it demonstrates the merits of FS using a variety of examples, with a thorough discussion of statistical issues and interpretation of results. ... 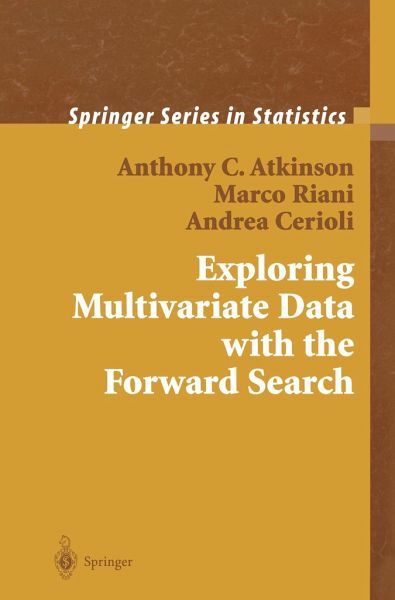 This book could serve as an excellent text for an advanced course on modern multivariate statistics, as it is intended." "The theoretical exercises with detailed solutions at the end of each chapter are extremely useful. I would recommend this book to practitioners who analyze moderately sized multivariate data. Of course, anyone associated with the application of statistics should find the book interesting to read." "This book deals with procedures to analyze sets of multivariate observations of continuous variables. ... The procedures are described in general, and then applied to a collection of data sets. ... The data are shown through tables and figures, the latter numbering 390, which means that illustrations are abundant. ... This is an attractive and useful book. It has a wealth of suggestions. ... The results of the analysis are usually presented in graphical form, and as said, the book has 390 graphs." "This is a valuable book on explorative multivariate data analysis which makes particular use of plots. ... The book is intended to serve as a text for a postgraduate course on modern multivariate statistics. The theoretical material is complemented by exercises with detailed solutions. ... This is a ... carefully written book on explorative multivariate data analysis, with a lot of details and examples especially on effects caused by outliers and departures from normality. I recommend this book for any applied statistician."